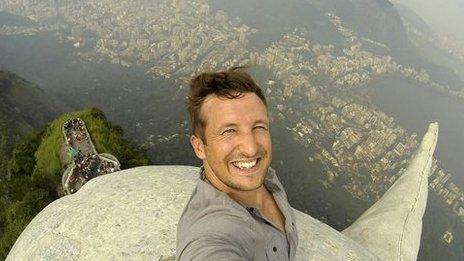 A British traveller has taken a selfie at the top of the Christ the Redeemer statue in Rio de Janeiro. 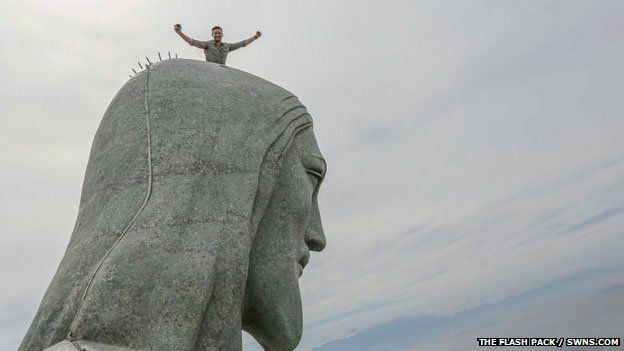 Lee Thompson said he knew the statue was being repaired and convinced the Brazil tourist board to let him climb it. 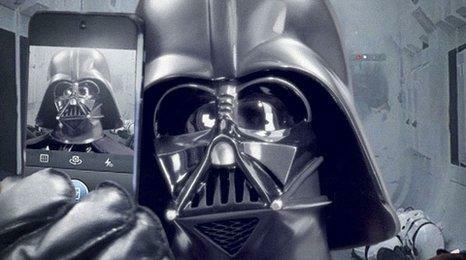 Writing in a blog post on his travel site, he said: "When the opportunity arose to take the world's first selfie with Jesus, I couldn't resist. "I was in total and utter awe as my eyes met with a vast panorama." Thompson entered the 38-metre monument, which was constructed between 1926 and 1931, via scaffolding and was helped to the top by two workmen. 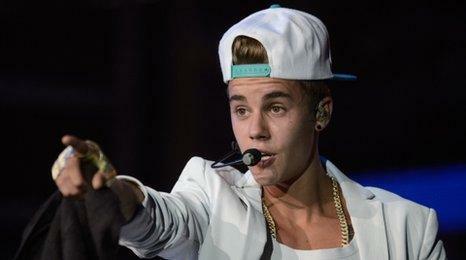 Christ the Redeemer stands on top of Corcovado mountain, which has a 710m-high peak. 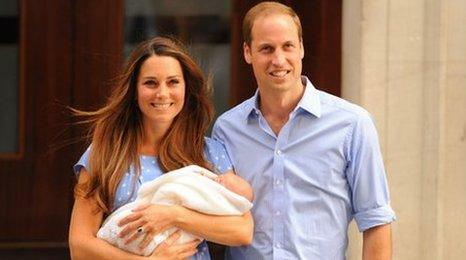 It's estimated that 5,000 people visit the landmark every day, with three million expected to see it during 2014. 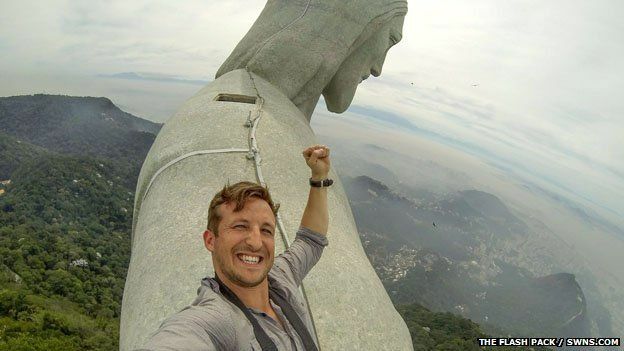 Thompson said: "Even though I had been to Rio many times and admired the iconic statue from afar, I had never had the time to visit the Christ the Redeemer statue in person, let alone imagine snapping a selfie of me popping out of his head just two hours later. 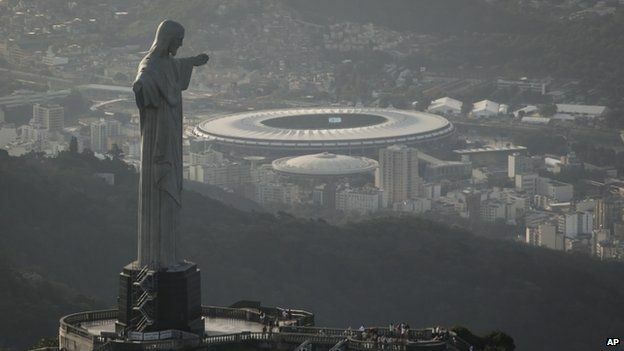 "A severe lightning storm had damaged the statue in January and I knew that workers were busy with repairs, so decided to take a stab in the dark and along with my colleague, Oliver Harvey, managed to convince the Brazil tourist board to allow us to climb to the top and take some seriously vertigo-inducing photographs. "Talk about a religious experience. "I've never been afraid of heights or tight spaces, but experiencing acrophobia, claustrophobia and profound awe at the same time was something truly remarkable."